Did the creation of the BBC go against the Acts of Union? 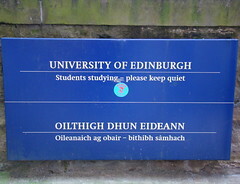 Did universal bilingualism give Scots an advantage in the past? Bilingualism’s effects also extend into the twilight years. […] Individuals with a higher degree of bilingualism — measured through a comparative evaluation of proficiency in each language — were more resistant than others to the onset of dementia and other symptoms of Alzheimer’s disease: the higher the degree of bilingualism, the later the age of onset. It’s also a well-known fact that Scotland punched well above its weight inside the United Kingdom. It appears to me that this started some decades after the 1707 Acts of Union and slowly started to fade out in the 20th century. Interestingly, most successful Scots must have been bilingual (or even trilingual) during this time — you needed to know English well to succeed, but in Scotland everybody spoke only Scots and/or Gaelic (depending on where they lived). I’m not sure when Standard Scottish English started replacing Scots and Gaelic as the primary language of large numbers of Scots, but it must have been a relatively recent event. For instance, when Norn was dying out around the time of the Acts of Union, it got replaced by Scots, not by English. On the other hand, the vast areas of the Highlands where Gaelic died out after the Clearances ended up speaking English, not Scots. It’s tempting to think that one of the factors that allowed Scotland to punch above it weight was the near-universal bilingualism. If this theory is correct, making all Scots bilingual again by supporting and promoting both Gaelic and Scots will make Scotland a more successful country in the future. Jamie Michael Schönlanker Hynds liked this on Facebook. It would be interesting to see the linguistic make-up of places like Silicon Valley and how many of the people working there are bi o tri-lingual? That is, among other factors is the multinational and so multilingual nature of the staff at Silicon Valley an undocumented and overlooked asset to the areas success in information technology? I’m guessing because so much university and business research is done solely in English with an anglophone linguistic view (where international doesn’t necessarily equate to multilingual) factors like language are overlooked or dismissed, partly because it may undermine the strength, meme and hegemony that English is the only true business language of the world. @arcofprosperity @anghyflawn how carefully are you distinguishing ‘English’ from Scots? #Gaelic last spoken by majority in Scotland c. 1500? @arcofprosperity @anghyflawn I second @WilsonMcLeod: depends on region and urban/rural divide. Would be Scots most everywhere until 18c.